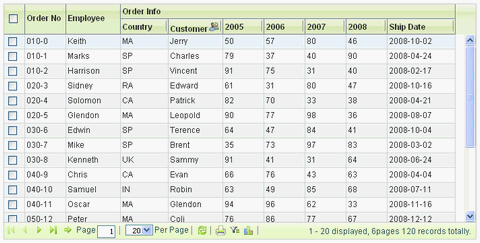 It supports online printing, to make it easy to print tabular data in WYSIWYG way. Paging enable developer display data page by page. Data will not be retrieved from server side until end user come to the page it is at. End user can sort records by clicking on the header of a column. Developer may define a new data type and a new way to sort. Bar diagram, line diagram and pie diagram are built in. Translation tabular data into diagram without any server-side coding. Data filter enables sigma grid to present the data users are interested in only. And you can download and use Sigma Grid freely under LGPL license. Hi, this free dynamic inline editable grid may be of some use. want to use dynamic dropdownlist in crud/index.php.